Experience the magic of La Boheme as the Grand Opera of Belarus brings this delightful opera classic to a theatre near you. From Monday 28th January until Saturday 16th March 2013, the impressive cast will be visiting 25 beautiful theatres spanning across the length and breadth of the UK. Make sure you catch one of our 39 dates for an unforgettable show. The theatre is one of the three theatres in the former Soviet Union to receive the status "Bolshoi". The National Opera and Ballet Theatre opened in 1933 and quickly gained an exceptional reputation for its high quality and professionalism. The theatre toured the most prestigious stages in the former Soviet Union, including the honourable, Bolshoi Theatre in Moscow. It gained the honorary "Bolshoi" status in 1940, (translated "Grand") and was given the title "Academic" in 1964. The theatre has continuously toured around the world, and visited more than 30 countries over the past fifteen years. Expect an unforgettable experience! Puccini's La Boheme is a passionate story of love at first sight. Set in 19th century Paris, it tells a story of love between Mimi and Rodolfo and their friends. The young, struggling artists face the hardships of relationships and life. They soon realise that love cannot conquer all. La Boheme is one of the world's most loved operas, a classic story that never ceases to captivate its audience. 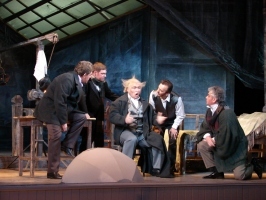 The Grand Opera of Belarus will be coming to The White Rock Theatre, Hastings to perform La Boheme on Friday 22nd February 2013. Do not delay in purchasing your ticket for the unforgettable and La Boheme, 2013. Visit www.operaandballet.co for more information.